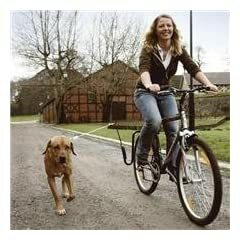 Using a bicycle dog leash is perhaps the best method of exercising your pet and yourself at the same time. This page was not my idea but a cycling colleague was looking to buy one and asked my advice. 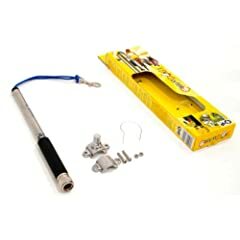 We had noticed other riders using regular dog leashes while we were out and about and felt they presented a safety issue. 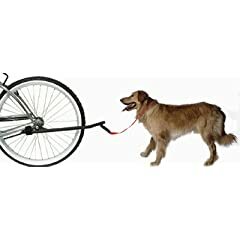 With a regular leash the possibly of getting it tangled in the bike or if your pet starts chasing a rabbit or squirrel, which we see plenty on our rides, they may pull on your bike. 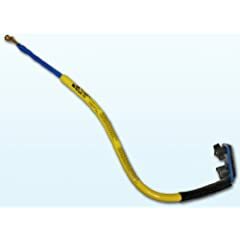 Dogs who are active just love these hands free leashes which solve these issues so why not consider it as well. 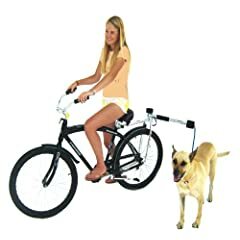 You need to walk your dog and maybe even get some exercise yourself, so a bicycle dog leash can help you do both. Depending where you live your route can be along scenic bike paths in a park, quiet residential streets or country roads. Along a forest path, dirt road or grassy shoulders is best.